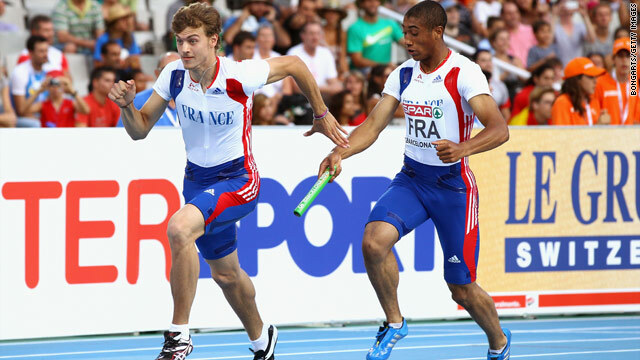 Pierre-Alexis Pessonneaux hands the baton to Christophe Lemaitre in France's 4x100m relay victory on Sunday. (CNN) -- New sprint sensation Christophe Lemaitre became the first Frenchman to win three gold medals at a major athletics event on Sunday as his country finished second in the table behind Russia at the European Championships. Lemaitre, the first white man to break the 10-second barrier over 100 meters last month, helped his 4x100m relay team to triumph in Barcelona and add to the 20-year-old's double in the individual sprints. Martial Mbandjock, who had earlier won two bronzes behind his teammate, snatched victory on the final leg as Italy were beaten back into second with Germany third. France's women's 4x100m team finished second behind shock winners Ukraine, who set the fastest time this year of 42.29 seconds. Poland denied the favored Russians a medal, but their larger neighbors won both the men's and women's 4x400m relay events as they finished with a total of 10 golds and 24 podium placings -- six more than France. Mahiedine Mekhissi-Benabbad and Bouabdallah Tahri gave France a 1-2 in the men's 3000m steeplechase as Spain's Jose Luis Blanco took bronze. The hosts ended the competition in sixth place with two golds and eight medals overall after Nuria Fernandez and Natalia Rodriguez finished first and second in the women's 1,500m ahead of third-placed French runner Hind Dehiba, while Russian favorite Anna Alminova was back in sixth. Alemitu Bekele denied Turkey teammate Elvan Abeylegesse a 5,000m-10,000m double after passing the tiring former world record-holder on the home straight in the shorter distance, with Portugal's Sara Moreira third. In the women's high jump, Croatia's two-time world champion Blanka Vlasic won with a late leap of 2.03m to head off Sweden's Emma Green and Germany's Ariane Friedrich. Germany's Christian Reif won the men's long jump with this year's leading mark of 8.47m to comfortably beat France's Kafetien Gomis and Britain's Chris Tomlinson. The British team finished third overall with six golds and 19 medals in total, a record for the team, after also taking silver in the men's 4x400m and bronze in the women's event. Poland's Piotr Malachowski won the men's discus from Germany's Robert Harting and Robert Fazekas of Hungary, while Switzerland finally won a medal after Victor Rothlin won the men's marathon in a time of two hours and 15.31 minutes to comfortably head off Spain's Chema Martinez and Russia's Dmitriy Safronov. This is the last time that the event will be held every four years, with the next staging in Finland to start a biennial cycle -- ending just 26 days before the start of the 2012 Olympics in London.